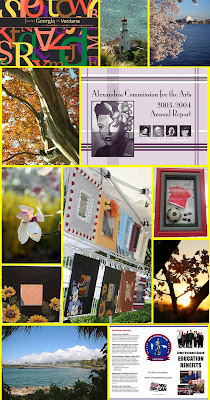 Jen-A-Fusion Fashion Accessories: Announcing the Artist of the Month for May! I am starting a new feature on my blog~ Artist of the Month. Each month, a different designer, artist or craftsperson will be introduced to you. Their biographies, background, passion and creations will be shared. The first installation is a close friend and talented artist, Stacy Rausch. She is not only my partner in crime at the Ballston Arts & Crafts Market, but also designed my logo, business cards and letterhead. I loved working with her and was impressed even further by her talent on the finished project. Answer: I have always been "crafty" and took art classes in high school, and then college. I didn't know exactly what I wanted to do with my art when I was younger, but it eventually evolved into a Graphic Design degree with a Studio Art minor. Q: Why do you continue? A: I love to create things (which incidentally, I named my company – Love to Create) and love to try new projects. My latest passion is photography – and I even plan on getting my Associates degree in it as well. A: I think every time I sell a piece of something I have made (whether it is jewelry, a frame, a photo or whatever) I feel like I am a success. Also I feel very proud that someone is willing to pay me for something that I created. Q: What is one of your greatest failures? A: Great works of art, a pretty sunset, friends, family, something that has an amazing design concept, art galleries. Q: Why do you create what you do? A: I love the feeling of taking a photo or creating a piece of jewelry and stepping back and saying "wow, I did that!" Q: Where is your favorite place to sell? A: So far I have enjoyed Ballston Art market. Q: What is one thing you love about your business? A: The creativity it requires and when I freelance, I can control what types of projects I take on, and that they can vary widely. Q: What is one thing you loathe? A: The time it takes away from my husband and friends. Also when involved in a huge project, on top of my full-time job, the lack of sleep. Q: What is your dream about your art? A: To someday own an art space that is part studio for myself, part art gallery for local artists and part classrooms where I and other artists would teach workshops and classes. A: To keep creating no matter what. I hopefully will be successful enough at it to continue making a living doing something I love and enjoy. Q: Where would you live if you could live anywhere? A: Probably somewhere in Europe so I could travel to a lot of countries easily. Q: What would you be doing if not this? A: Probably a pastry chef. A: I am starting on a year to 18-month course to get my Associates Degree in Photography starting in May. In an ironic twist of fate, Stacy also designed the postcard for the show she will be in tomorrow! (I'll be there too...) Come and check out all her work, photography, collage and graphic design. 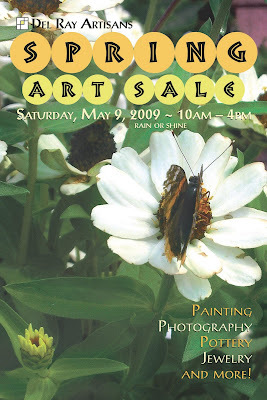 When: Saturday, May 9th from 10am to 4pm RAIN OR SHINE!! Why: Because you still didn't buy a Mother's Day gift!